Three musicians from Brasília - the capital of Brazil - with the most diverse musical references gave rise to Jazzmine, which is a full-bodied instrumental sound. The authorial trio repertoire has all the musical references that influenced Luis H. Silva, guitar, Alan Dieggo, drums, and Jefferson Amorim, electric bass. Audience can expect a mix of typical Brazilian sounds like samba and baião, rock feeling, progressive and jazz influences that result in a sophisticated music. It could just be a band of Jazz Fusion, but the musicians go far beyond. "We do a song that has a wide variety of styles and rhythms. Each one of us came with its references that generated a very good musical chemistry between us. Everything is possible in our sound", says the drummer. The partnership between the musicians has a long history, although Jazzmine was formed only in 2014. The trio has met at the Music School of Brasília, played together at night with bands and artists from the city and since 2014, they teach at the same musical school called BSB Musical. It was during the intervals between classes that from a drum groove came the first song and the insight that they could create a project together. "Our writing process is in trio. The songs begin with a rhythm, groove or melody suggested by one of us and we get to work. Our first composition came from three bars. Then came a very arduous process of testing and trials, "explains the bassist Jefferson Amorim. Jazzmine released their first EP called "Three songs album" in partnership with the Swedish label Record Union in March of 2015 making available the songs Casa de marimbondo, Madness and tango and Viagem Brasil to their fans in various platforms of music distribution by internet. 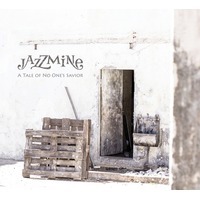 In 2015 Jazzmine released their show "A tale of no one's savior", namesake to the first album of the trio released in December of 2017.